Form as for the Sicilian Circle, except that each Lead has two Follows, one on each side. Chassé with Right Opposite (8 bars): Each Lead takes hands* with and chassés out† with his right-hand opposite (4 bars), and chassés back to place (4 bars). * Hand hold isn't specified in any of the sources below - two hands, crossed hands, or waltz position are all possibilities. † Note that the chassés in the first part occur over the elbows, so if waltz position is preferred, try reverse waltz position. This can either be a leisurely chassé a little ways outside the set, or it can be a rambunctious galop across the room and back, as described in Hillgrove's description of the Sicilian Circle. Chassé with Left Opposite (8 bars): Each Lead takes hands with and chassés out with his left-hand opposite (4 bars), and chassés back to place (4 bars). Forward and Back and Pass Through (8 bars): All forward and back (4 bars), and pass through to meet the next trio coming from the opposite direction (4 bars). Several sources note that the dance is continued until the leader feels it has gone on long enough, and that this dance is usually employed as a finishing dance, similar to Sir Roger De Coverley. Some go so far as to say it is only to be employed as a finishing dance. Any lively tune with 24 bars with do. Hazard 1849 specifies a Scotch reel. Hillgrove 1863 specifies music in 6/8 time. "8 bars" above can be interpreted to mean 16 counts (or steps). Hazard also notes that "the gentleman with his two partners can retire from the dance at his pleasure," although it's not clear how that can be done elegantly without leaving one's current and future opposites in the lurch. Brooks (along with several other sources) describes the formation as a longways set, and specifies that "when the first three get to the bottom, they do not change sides. The lady on left going down is on right going up." In this dance each gentleman has two partners—form a line by three's, each set facing each other—this dance is commenced by all at the same time—the dance commences by the two gentlemen that face each other, taking each other's partner on the right, dance to the side and back to your places, then take the left hand ladies and do the same—take both of your partners by the hands and dance up to the other set and back—forward again and pass each other—then commence the dance again with the next set—this dance is continued until the master of the ceremonies thinks it has been gone equally through, and generally finishes the evening's festivity, and ought not to be used at any other time. 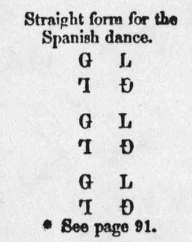 The dancers face up and down, as in the Spanish dance. All the gentlemen stand in a line, every two gentlemen facing each other; the ladies in two lines the same, opposite their partners; thus there will be two sets of six dancers, facing each other alternately all the way down. The top gentleman will balancez to the lady on the bottom gentleman's right hand and turn her, while the bottom gentleman will do the same with the lady on the top gentleman's right; they will both execute the same figure with the respective ladies on the left of the gentlemen; the two lines of three will join hands and chassez up to each other and pass through their lines; those meeting the next set below will do the same figure with them until they reach the bottom of all; those who go up of course do the same as they go up; all commence at once. The gentleman with his two partners can retire from the dance at his pleasure. This also is only danced as a finale to a ball. It can be danced to any lively Scotch reel tune. Each gentleman has two partners; form as for the Spanish Dance. Each gentleman chassee with right hand lady, opposite and back—chassee out with the left hand lady opposite and back—all forward and back, pass through to the next couples. Music in Six-Eight Time—Three Parts. 1. Each Gentleman takes the Opposite Lady on His Right Hand , and then chassez to the right across the room and back, 8 bars. 2. Take the Other Lady, and chassez to the left in the same manner, and back again to places, 8 "
3. All Forward and Back (joining hands); forward again, and pass through between each other, meeting the next set, with whom the same figure is repeated, 8 "
This dance is continued in the same manner, until the Master of Ceremonies thinks proper to stop. In this dance gent must have two ladies, one on each side of him. Six are required, two gents and four ladies, who stand facing each other. Any number can join it. Figure:—The gent turns the lady on his right, with right hand, 4 bars; lady on left with left hand, 4 bars; then half promenade with right hand partners, 4 bars: and half right and left to places, 4 bars; then forward and back, 6 bars: forward again and pass through, 4 bars: meet the next, and so proceed. When the first three get to the bottom, they do not change sides. The lady on left going down is on right going up. Each gentleman has two partners; form, one trio opposite the other. Each gentleman chassez out with right hand lady opposite, and back; chassez out with the left hand lady opposite, and back; all forward and back; pass through to the next trio. Is an antique dance in which each gentleman has two ladies, all formed in a column down the room, so that each gentleman and two ladies form a line, and have their vis-a-vis. Each gentleman balances to his vis-a-vis on the right and turns. 8 bars. Then to the lady on the left and turns. 8 bars. Then all forward and back. 4 bars. Forward again and passes through to the next three, with whom, as their vis-a-vis, the figure is repeated, and thus the dance is continued by all dancing simultaneously, till the Master of Ceremonies chooses to terminate it. This dance is continued in the same manner, until the Floor Manager thinks it proper to stop. Continue until the leader thinks proper to stop. The dancers face up and down, like the Spanish dance. All the gentlemen stand in a line up and down the room, every two gentlemen facing each other; who have two ladies on either side of them, facing as they do; thus there will be two sets of six dancers, facing each other alternately, all the way down. The top gentleman will balance to the lady on the bottom gentleman's right hand and turn her, while the bottom gentleman will do the same with the lady on the top gentleman's right; they will beth execute the same figure with the respective ladies on the left of the gentlemen; the two lines of three in each will join hands and chasse up to each other and pass through their lines; those meeting the next set below, will do the same figure with them until they reach the bottom of all: those who who go up, of course, do the same as they go up; all commence at once. The gentleman, with his two partners, can retire from the dance at his pleasure. It only answers for a finale at a ball. It may be danced to any lively Scotch reel tune. Each gent has two partners. 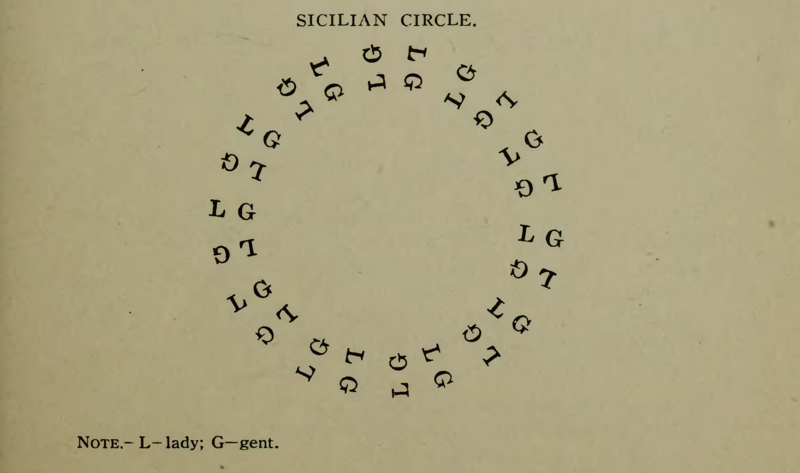 Form as for Sicilian Circle. Gent chasse with right-hand lady, opposite and back (8); chasse with left-hand lady, opposite and back (8); all forward and back (4); forward, and pass by to next couples (4).